Created by Sociabble, the Employee Advocacy Score (EA Score), is a unique ranking that allows companies to measure employee advocacy, by gauging the relationship between internal employee engagement and external brand advocacy. The EA Score uses a combination of employee metrics and social listening tools to determine a score between 0 and 100. The higher a company’s employee engagement and advocacy level, the higher the EA Score. 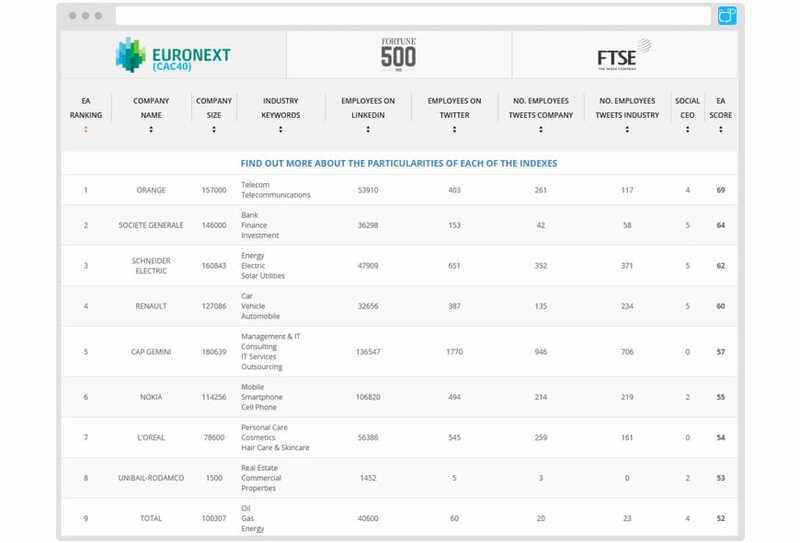 2017 EA Scores for the top 100 Fortune and FTSE companies, as well as those listed on the CAC 40 (EuroNext) index, have now been revealed. Want to know how the world’s leading companies compare when it comes to employee advocacy? Download the report. Want to know how your company compares?